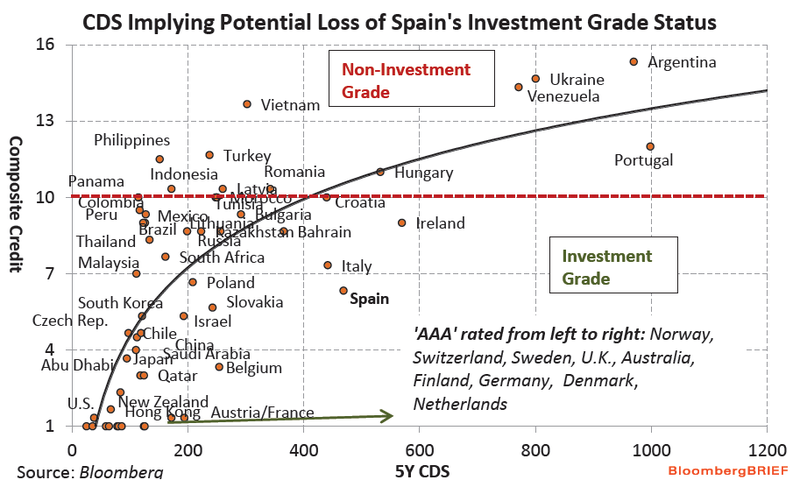 “According to CDS-implied credit ratings, renewed escalation of the European debt crisis may place Spain’s investment-grade status at risk, while France may face a downgrade to A- on S&P’s rating scale. The composite credit rating is calculated by quantifying the three primary agencies’ ratings, where available, and averaging the results for each country. A score of one indicates the highest rating across all three companies. A score of 10 or better indicates investment grade. The cost of five-year CDS is the amount traders are willing to pay to protect against a default on the country’s underlying debt. The cost of protecting against a Spanish default through five-year CDS has risen to about 470 basis points, which is more than 200 basis points higher than similar protection on Turkish sovereign debt which holds a non-investment grade composite rating of 11.7. Spain’s composite rating is 6.3, equivalent to A on the S&P scale. France may risk the largest nominal downgrade of the countries surveyed, with its CDS price implying a potential downgrade to 6.8, or A-, from its present composite rating of 1.3, or AAA. This would still fall within the investment grade range. TBP Readers who want a free trial to Bloomberg Brief can subscribe here.